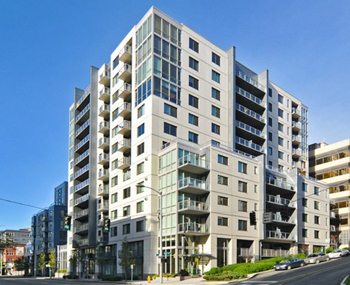 The Parc Condominium in Belltown features two residential towers; the north tower being 9 stories and the south tower is 13 stories. The development is nestled next to the Avenue One Condo and an office building, which will block views on the easterly facing units on the lower levels. Upper level south facing homes will have excellent views of downtown. The buildings are located a short distance from the Seattle waterfront and the Olympic Sculpture Park. The Parc may be listed with several addresses: 76 Cedar St (south tower), 81 Clay St (north tower) and 2716 Western Avenue. The main entrance to The Parc is through the south tower, right at the corner of Cedar and Western.